The potential of using an oral vehicle for drug delivery in diseases of the posterior segment is exciting, especially for a disease with a large population of patients, such as age-related macular degeneration (AMD). Topical treatments, historically, have difficulty penetrating the cornea and anterior chamber to reach the posterior segment effectively. Intravitreal injection can be effective and is in wide use today, but frequent administration places burdens on patients, practices, and the health care system. An effective drug delivered via the oral route would be welcomed by retina practitioners. • A phase 3 study of emixustat demonstrated no benefit in the treatment of GA secondary to AMD. • Despite its disappointing results, the SEATTLE study was the largest study ever conducted of the natural history of GA.
• Results of a phase 3 study of lampalizumab, the first drug to show promise in treatment of GA in dry AMD, are expected at the end of 2017. After underwhelming results from two trials of drugs targeting the visual cycle, researchers have abandoned this approach. The SEATTLE study of emixustat was still important in a number of ways, however, even though it did not meet its primary endpoint. First, it was the largest study ever conducted on the natural history of GA, and publication of the results will add to our general knowledge regarding GA. There had been speculation about whether patients with unifocal or multifocal patterns of GA progressed faster. The study revealed no difference in progression. Additionally, the side effects of the medication observed in the SEATTLE study reaffirmed a theory proposed by Sunness et al.4 When this visual cycle modulator was used to slow down metabolism in the retina, the photoreceptor cells became slower to adapt to visual changes. Specifically, there was a notable decrease in low-luminance visual acuity. This is a concern for the many mainly elderly patients with AMD, who face difficulties driving and functioning in dim light. With the failure of the emixustat study to meet its endpoint, low luminance visibility remains a key biomarker for GA and the most important predictor of its progression. In the July/August 2016 issue of Retina Today, Carl C. Awh, MD, wrote about X-82 (Tyrogenex), an orally administered small-molecule tyrosine kinase inhibitor derived from a cancer drug that inhibits VEGF and PDGF, in the treatment of patients with wet AMD. To read Dr. Awh’s article, click here. The company is studying X-82 in the interventional phase 2 APEX trial, which is estimated to be completed by January 2018. 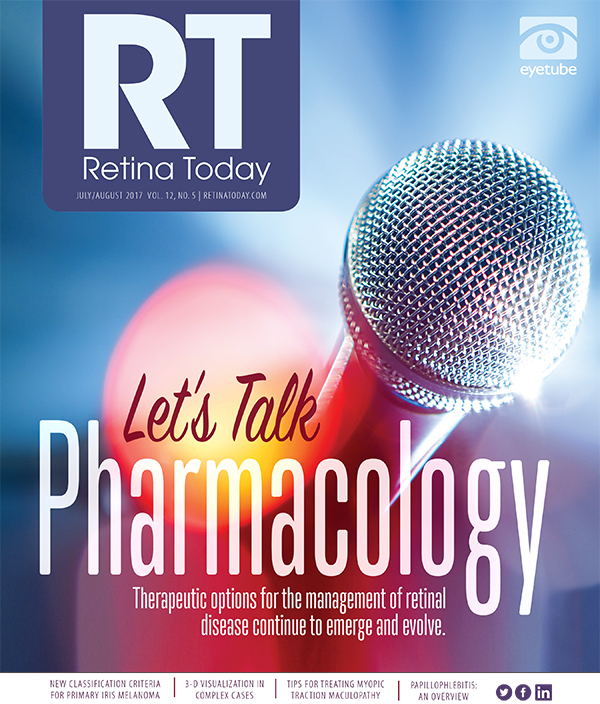 In the April 2015 issue of Retina Today, Peter K. Kaiser, MD, provided an overview of the diabetic macular edema (DME) pipeline, including the oral steroid analogue danazol (Optina, Ampio Pharmaceuticals). The drug’s ability to decrease vascular permeability is being investigated in patients with DME. Access his article here. According to the company’s website, a large, late-stage US clinical trial of the drug for oral treatment of DME is planned. While oral formulations seem to be a current goal for the treatment of AMD and DME, this mode of delivery has long been the mainstay of treatment for posterior noninfectious uveitis. However, although oral corticosteroids are preferred for rapid control of active uveitis, significant ocular and systemic side effects are associated with prolonged use, and many patients with chronic uveitis require long-term therapy. Several new drug delivery mechanisms and new local and systemic agents are under development and in clinical trials, and these may play important roles in the future treatment of patients with uveitis. Despite disappointing results for the oral drugs emixustat and fenretinide, this is not necessarily the end of the line for pharmacologic treatment of GA secondary to AMD. A phase 3 study of lampalizumab (Genentech), delivered via intravitreal injection in patients with GA, is under way.5 Lampalizumab is the first drug to show signs of reducing the progression of GA, and its mechanism is very different from that of the visual cycle moderators. Rather than slowing down the metabolism of photoreceptors cells, lampalizumab inhibits complement factor D to suppress inflammation. In investigations to date, lampalizumab has required monthly injections to maintain efficacy.5 Additionally, the drug was most effective in a subgroup of patients with a particular genotype. Even with these limitations, lampalizumab is still the first drug to have demonstrated promise as a treatment for patients with GA secondary to dry AMD. Although wet AMD is responsible for most of the vision lost due to AMD, dry AMD affects a much larger population of patients. In learning about the natural history of patients with AMD, however, we are realizing that there is not a bifurcation of pathways between the two. In fact, many patients with wet AMD develop some macular atrophy. If we find a drug that can treat dry AMD, this may be beneficial not only for that group of patients, but also for those with wet AMD. The introduction of a drug to inhibit the effects of GA in AMD patients will be a game-changer, and the intravitreal drug lampalizumab is showing promise. Ophthalmologists eagerly await the results of the lampalizumab phase 3 clinical trials. 1. Dugel PU, Novack RL, Csaky KG, Richmond PP, Birch DG, Kubota R. Phase II, randomized, placebo-controlled, 90-day study of emixustat hydrochloride in geographic atrophy associated with dry age-related macular degeneration.Retina. 2015;35(6):1173-1183. 2. Acucela Announces Top-Line Results from Phase 2b/3 Clinical Trial of Emixustat. BusinessWire. www.businesswire.com/news/home/20160525006550/en/Acucela-Announces-Top-Line-Results-Phase-2b3-Clinical. Published May 25, 2016. Accessed June 20, 2017. 3. Mata NL, Lichter JB, Vogel R, Han Y, Bui TV, Singerman LJ. Investigation of oral fenretinide for treatment of geographic atrophy in age-related macular degeneration. Retina. 2013;33(3):498-507. 4. A study investigating the efficacy and safety of lampalizumab intravitreal injections in participants with geographic atrophy secondary to age-related macular degeneration (CHROMA). Clinicaltrials.gov. www.clinicaltrials.gov/ct2/show/NCT02247479. Updated November 1, 2016. Accessed June 6, 2017. 5. Rhoades W, Dickson D, Do DV. Potential role of lampalizumab for treatment of geographic atrophy. Clin Ophthalmol. 2015;9:1049-1056. • managing partner, Retinal Consultants of Arizona, Phoenix; clinical professor, USC Roski Eye Institute, Keck School of Medicine, University of Southern California, Los Angeles; and physician executive director, Banner Eye Institute, Phoenix, Ariz.